"It's not the absolute feeding frenzy that we had for the last three springs before this one. By any definition for the rest of the world, it's still a very, very strong market. It's just not as crazy hot as it's been." That's how Patrick Carlisle, chief market analyst at Paragon Real Estate Group in San Francisco describes the recent housing market. A Paragon report that was released last week shows that home prices in San Francisco have cooled significantly. In April and May, the median price of a house rose 2% from the prior year to $1.38 million, which pales in comparison to April and May of 2015 which saw a 23% increase from the prior year. 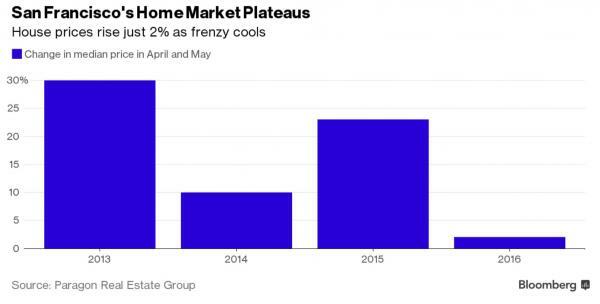 As Bloomberg reports, the cooling is most notable at the high end of the market where there were a record 95 homes on the market for at least $2.5 million at the end of April, up 42% from the prior year. Luxury condos - defined as $2 million or higher - saw inventory climb 44% to a high of 75 units, and sales of all luxury homes declined from January to May for the first time since 2010. The slowdown should come as no surprise, as we have pointed out quite often over the past several months, the second tech bubble has burst. As the layoffs and consolidation continues, coupled with venture capital pulling back, things will continue to get worse for Silicon Valley. As Bloomberg notes,venture capital investments in Silicon Valley fell almost 20% in the first quarter from a year earlier to $4.9 billion. Also, for those paying attention, earlier this month we reported that Chicago-based REIT Equity Residential cut guidance for the second time in two months due to recent under performance in the company's San Francisco portfolio, something the firm hadn't noted in it's prior guidance warning,which means conditions have started to deteriorate rapidly. Recall also that in May we said that the Silicon Valley real estate bubble has also burst, as the Palo Alto luxury home market cooled to the point where one real estate consultant declared that "the peak is behind us." While optimism persists from those such as Danville, California developer Gregg Nelson who said "There's not an adequate supply for the level of demand. The prices are hindering what would otherwise be a lot more sales", we'll just continue to point out the facts - which are that the second tech and housing boom for Silicon Valley has come to an end.